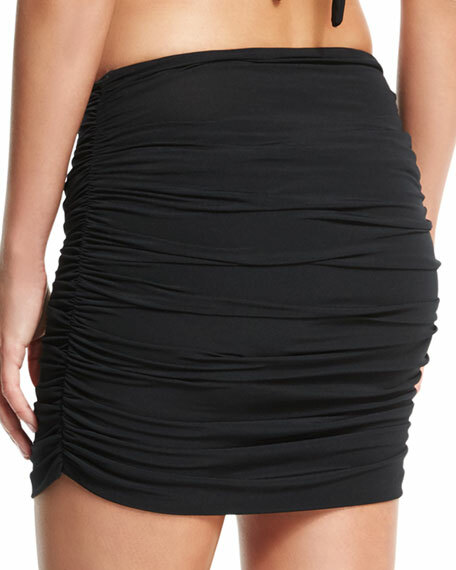 Norma Kamali ruched microfiber skirt. For in-store inquiries, use sku #264762. T by Alexander Wang mini skirt in faded black denim. Rise sits below natural waist. Band-less waist; flat front. Exposed silvertone back zip. Released raw-edge hem. Slim silhouette. Cotton. Made in USA of imported materials. Alice + Olivia "Shaylee" skirt with asymmetric front. A-line silhouette. Mini length hem. Exposed back zip. Polyester, shell. Polyester/spandex, lining. Imported. Balenciaga mini skirt in Japanese denim. Mid rise; V waistband. Five-pocket style. Sheath silhouette. Mini length. Button/zip fly; belt loops. Cotton; lining, polyester/cotton. Imported.